In this time of State Capture and a slate of political transgressions that defy categorical divides of “white and blue-collar” criminal activity, a film about Kebble’s demise cannot function simply as entertainment. If anything, this story, in its portrayal of the mingling between our private and our public sectors, can function as the post-mortem of our captured state. If the lines were blurred then, they are now certainly out of sight. By AYANDA CHARLIE. The murder trial of mining billionaire Brett Kebble in 2005 was the story that would change South Africa’s Hollywood-inspired image of organised crime, gleaned from series like The Sopranos and The Wire, and the classic Godfather movies. The reality is that the South African underworld is even more twisted and shady than anything in the Mafia genre – and there’s nothing that brings this home more than Warren Batchelor’s 204: Getting Away with Murder. 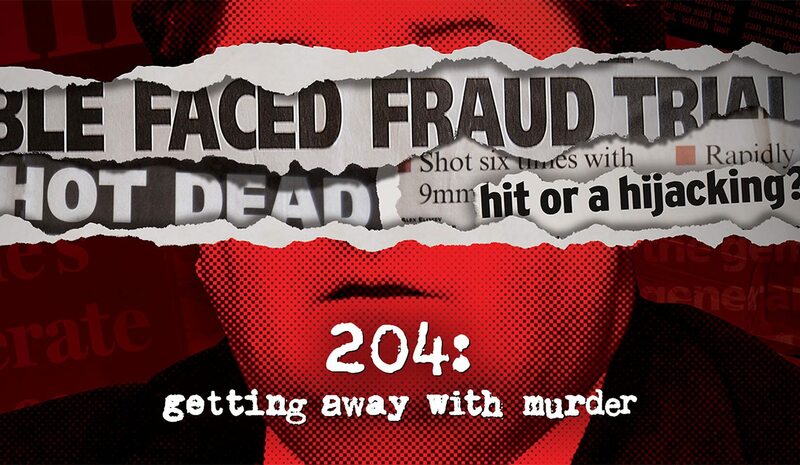 The documentary unpacks the Kebble murder mystery in just under two hours, leaving the viewer more baffled than ever. Perhaps one of the reasons for this is the peculiar way in which Johannesburg’s blue-collar hustlers found themselves in with two of the country’s richest “white-collar” businessmen: Glenn Agliotti and Brett Kebble. This convoluted story is untangled by the film’s producers, with the help of the acquitted, self-confessed murderers. Also offering perspectives on the narrative are the late former National Commissioner of Police, Jackie Selebi, Agliotti himself, and two of the case’s most knowledgeable journalists. But while all these testimonies might carry weight in our courts, it is the unrelenting testimonies of Kebble’s brother and father, Guy and Roger Kebble, of a lifetime spent with Brett that threatens to further complicate the saga. They say that the Brett they know would never volunteer to be killed – he’d sooner do it himself. And so, the mystery weaves itself yet again: Was Brett’s an organised murder, or suicide? Was the impending bankruptcy and criminal investigation enough to make Kebble want to end his life? Or did it make him a target among his colleagues? Experts never came to a consensus on the way in which Brett was killed, and much of this is believed to be a result of the police’s negligence. And while this might be unsurprising, it is devastating to see the reach of its effects. It is even more devastating to think of its effects on the Kebble family and the suicide of Brett’s father in 2015, a real-life tragedy that wouldn’t be out of place in the finale of a Hollywood crime series. In this time of State Capture and a slate of political transgressions that defy categorical divides of “white and blue-collar” criminal activity, a film about Kebble’s demise cannot function simply as entertainment.